Many observed President Obama pay homage at the Pentagon yesterday to the nearly 3,000 victims who lost their lives on Sept. 11, 2001. But by nightfall, another commemoration ceremony was gathering — 50 service members joined together to give each rep, each lunge, each workout move in honor of the victims who died 13 years ago. Air Force Staff Sgt. 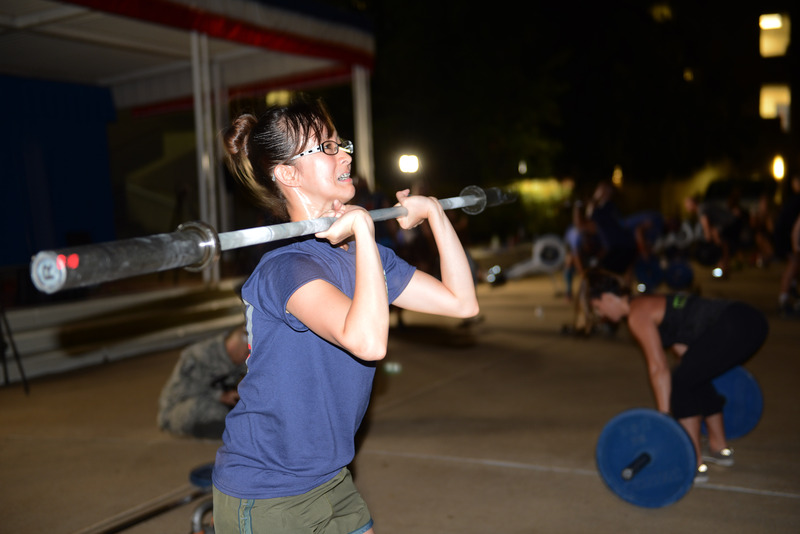 Ma Antonette Cabantog participates in an intense physical training workout at the Pentagon, Sept. 11, 2014, held to commemorate the 13th anniversary of 9/11. (U.S. Army photo by C. Todd Lopez). Army Staff Sgt. River Mitchell, a chef in the secretary of defense mess at the Pentagon, planned the workout of the day — or “9/11 Tribute WOD” — so that his fellow comrades could test their strength on behalf of the fallen in a unique way, according to a report from C. Todd Lopez, Army News Service. 175 thrusters, representing United Airlines flight 175, which crashed into the South Tower of the World Trade Center; 110 deadlifts and 110 lunges to symbolize the 110 floors in each of the World Trade Center towers; 2,001 meters of rowing to symbolize the year; 93 box jumps to symbolize United Airlines flight 93, which crashed in Shanksville, Pennsylvania; 77 kettle bell swings to symbolize American Airlines flight 77, which crashed into the Pentagon; and 125 burpees to symbolize the 125 personnel killed at the Pentagon. While the workout was more difficult than most expected, Mitchell said the purpose was to go beyond a personal challenge. He said he wants Americans to remember that the nation is still at war. Mitchell said he also wants the PT exercise to go mainstream — at least for the Army. To read more accounts from service members who participated in “9/11 Tribute WOD,” click here.